Take a break from Chiang Mai with a short trip to Wat Phra That Doi Suthep in Doi Suthep, about 1h 10 min away. Spend the 3rd (Wed) wandering through the wild on a nature and wildlife tour. Next up on the itinerary: explore the ancient world of Wat Chedi Luang Worawihan, take in the spiritual surroundings of Wat Phra Singh, relax and rejuvenate at some of the top local wellness centers, and meet the residents at Chiang Mai Zoo. For photos, maps, reviews, and other tourist information, go to the Chiang Mai custom trip planner. Toronto, Canada to Chiang Mai is an approximately 27-hour flight. You'll lose 12 hours traveling from Toronto to Chiang Mai due to the time zone difference. Traveling from Toronto in May, expect Chiang Mai to be much warmer, temps between 41°C and 28°C. Wrap up your sightseeing on the 5th (Fri) early enough to travel to Patong. Spend the 5th (Fri) among aquatic life with a scuba or snorkeling tour. There's still lots to do: enjoy the sand and surf at Patong Beach, stroll through Kata Beach, soothe aching muscles at some of the top local wellness centers, and have some family-friendly fun at Dino Park Mini Golf. For more things to do, photos, traveler tips, and more tourist information, refer to the Patong holiday planner. Traveling by combination of flight and taxi from Chiang Mai to Patong takes 3 hours. Alternatively, you can take a bus; or drive. Expect little chillier weather when traveling from Chiang Mai in May: highs in Patong hover around 38°C, while lows dip to 28°C. Wrap up your sightseeing on the 8th (Mon) early enough to travel to Pattaya. Start off your visit on the 8th (Mon): enjoy the sand and surf at Wong Amat Beach and then don't miss a visit to Sanctuary of Truth (Prasat Sut Ja-Tum). 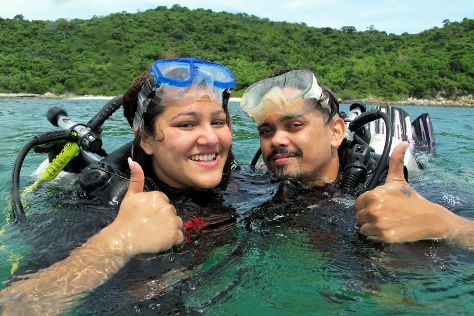 On the next day, choose your vessel at Dive In Pattaya and then take in nature's colorful creations at Nong Nooch Tropical Botanical Garden. To see ratings, where to stay, traveler tips, and more tourist information, read Pattaya itinerary maker. Traveling by combination of taxi, flight, and train from Patong to Pattaya takes 4 hours. Alternatively, you can drive; or take a bus. In May, daytime highs in Pattaya are 38°C, while nighttime lows are 32°C. Finish up your sightseeing early on the 10th (Wed) so you can go by car to Bangkok. Spend the 14th (Sun) wandering through the wild on a nature and wildlife tour. 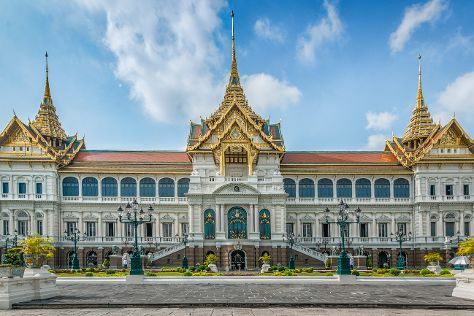 There's lots more to do: explore the historical opulence of The Grand Palace, soothe aching muscles at some of the top local wellness centers, take in the spiritual surroundings of Wat Pho, and get a taste of the local shopping with Chatuchak Weekend Market. To see traveler tips, maps, more things to do, and other tourist information, go to the Bangkok trip itinerary planner. You can drive from Pattaya to Bangkok in 2 hours. Alternatively, you can take a bus; or take a train. In May, daytime highs in Bangkok are 41°C, while nighttime lows are 32°C. Finish up your sightseeing early on the 14th (Sun) so you can travel back home.